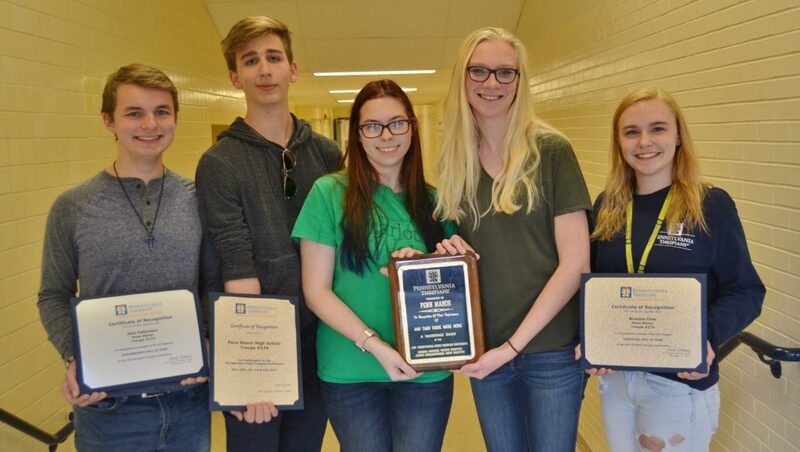 Penn Manor students received several awards for their work during the PA Thespians State Conference over the weekend in York. Brianna Clow received a Superior rating in scenic design for her rotating stage design for this year’s fall play, “And Then There Were None,” during the conference, held Nov. 30 to Dec. 2 at Central York High School. She also was named to the Pennsylvania Thespians Technical Hall of Fame. Brianna is now eligible to compete in scenic design at the International Thespian Festival in Lincoln, Nebraska in June. Also at the conference, Max Minnick received an All-Star Cast Member award for his portrayal of Captain Lombard in “And Then There Were None,” and Alex Patterson was named to the Pennsylvania Thespians Performance Hall of Fame for his body of work. Alex, a senior, has performed in every Penn Manor theater production since his freshman year. The fall play also was honored for being selected as one of only five productions performed during the conference, and the Penn Manor theater troupe was recognized as a Gold Honor Troupe. Congratulations, students, for representing Penn Manor’s theater department so well! From left, actors Alex Patterson and Max Minnich; Charlotte Molitoris and Ashley Seiger, co-presidents of Penn Manor’s theater troupe; and set designer Brianna Clow.